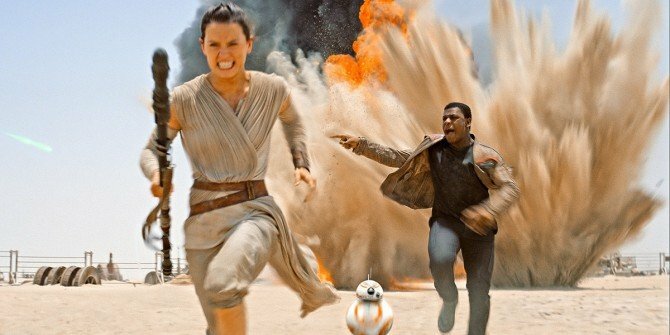 Daisy Ridley and John Boyega fast became the two breakout stars of 2015 after anchoring J.J. Abrams’ Star Wars: The Force Awakens, spawning online discussion about their future in 2017’s Star Wars: Episode VIII and, in particular, a budding romance between their characters of Rey and Finn. While speaking to Variety (via io9), Boyega talked briefly about Rian Johnson’s Episode VIII, trumpeting the sequel as “darker and bigger” than its predecessor – aren’t they all? – but the Attack the Block actor really piqued the interest of fans when quizzed about Rey and Finn’s potential romance. I mean, we didn’t establish a romance in seven; we never played it that way. Daisy and I, we’re friends. Finn and Rey – they’re just friends. Finn is a storm trooper, so he doesn’t really know what’s going on. So the romance thing is something that’s going to be interesting in the next installment. It’s not going to go the way you think it’s going to go. First crossing paths on the desert planet of Jakku, Finn and Rey’s endearing friendship was one of the many highlights of The Force Awakens last year. On the one hand, Ridley’s character was a fiercely independent scavenger; while Boyega’s wayward Stormtrooper proved to be an emphatic, if reluctant lead. Besides, what about the pairing of Finn and Poe? With Rian Johnson at the helm, Star Wars: Episode VIII makes a beeline for theaters on December 17, 2017 – potentially with a Tom Hardy cameo in tow.